2 Who Should Read this Guide to Finding the Best BBQ Gloves? If you’re the type of person that enjoys cooking on your BBQ grills, then you need a pair of gloves to protect you. Wait …no, you need the best grilling gloves. 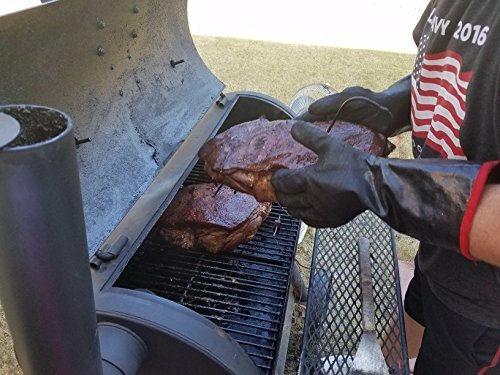 You see, when it comes to BBQ gloves, you should never settle for less – you need something that is really going to keep you protected for the long haul. If you go out there and purchase the first pair of gloves you can get your hands on, you may end up regretting it as you’re applying Aloe Vera to your burn. 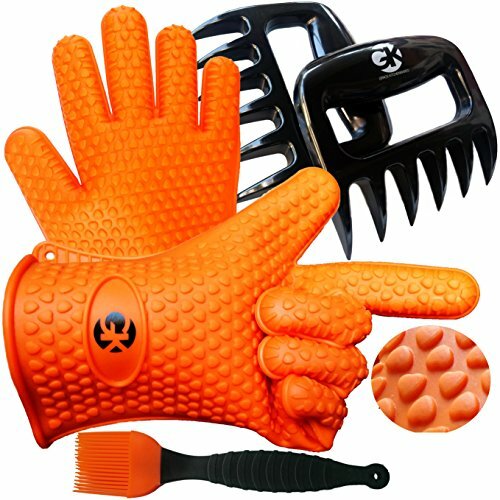 While I have an amazing list of what I feel is the best grilling gloves, before I go into details about that list, I first wanted to explain what you should be looking for in the best barbeque gloves. If you are going to be handling foods that have juices (like juicy meats), you’re going to want to go for a pair of silicone gloves. When you are wearing a pair of silicone gloves, if scalding juices were to spill on your hands, you won’t have to worry. Plus, as an additional bonus, silicone gloves are water resistant, which makes them super easy to clean. Silicone is similar to rubber and it is very diverse. All of the above reasons make silicone a popular choice. It is also great for carrying pots, trays and grill plates. Plus, it is 100% waterproof and fairly cheap – it’s even dishwasher safe. However, silicone can have its downside. For starters, the gloves can be a bit on the bulky side and this makes it hard to move your hands around. Secondly, silicone gloves have a tendency to be loose around the wrists, which makes it so that radiant heat can find its way inside. It is also important to take note that if you spill grease on the gloves, it can get slippery. Some gloves are made of Aramid fabric – this is a class of heat-resistant and strong synthetic fibers. Firefighters are known for using this material as their gear is made from it. The material is also used in the aerospace industry and in various military applications. Aramid Fibers have a high resistance to abrasions and heat. So, if you find gloves that are made of this material, you can rest with the satisfaction of knowing they’re both heat resistant and cut-resistant. The one downside I can find with this material is the fact that it is not water resistant. However, despite it all, you will have a high-quality heat-resistant product if you go for gloves that are made of Aramid fabric. Who Should Read this Guide to Finding the Best BBQ Gloves? Individuals that are looking for a pair of gloves for barbecuing and smoking should read this guide. Smokers, grills and BBQ’s are made of metal, and it goes without saying that metal gets really hot around heat. When handling grill plates, hot coals, cooking trays, chimney starts, and other hot BBQ equipment, you should wear a good pair of insulated gloves. Have you ever tried to pick up something that was hot with a kitchen towel? If so, you probably know why we recommend a pair of BBQ gloves. The gloves on our list that you are about to read are gloves that we have thoroughly researched in order to make sure we chose the best. 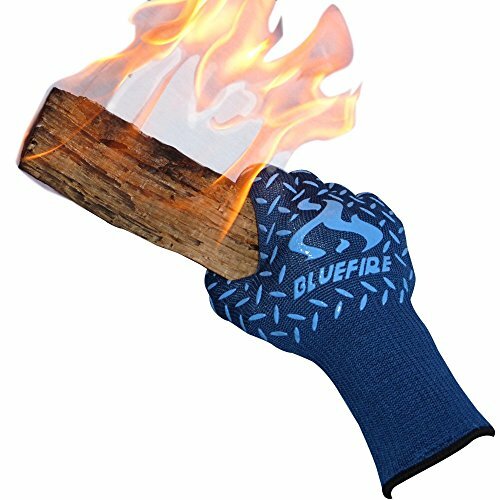 When it comes to the best heat resistant BBQ gloves, hands down, our number one choice would be BlueFire Pro Heat Gloves. These gloves captured our attention from beginning to end, starting out with them being both heat-resistant and cut-resistant. For this reason, they are the perfect match for all of those backyard BBQs. If you like, you can even use them as oven mitts, or when you’re working around the woodstove. BlueFire Pro Heat Resistant Gloves are made of a mixture of high-quality materials, including Nomex, Aramid, Silicone, and Kevlar. They are designed for use around high temperatures that reach up to 932 degrees F and sharp blades. I really like how the long cuffs go up past the wrist and for this reason, I feel as if they would make great welding gloves as well. 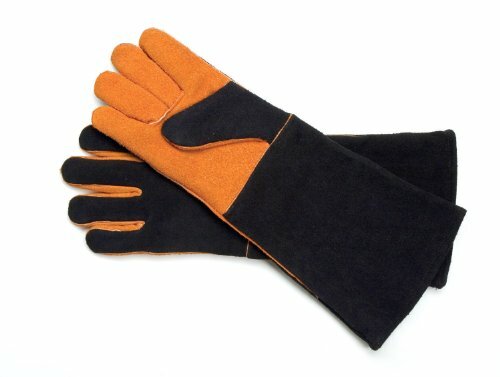 These gloves are recommended by professional and amateur chefs, welders, and even firemen. 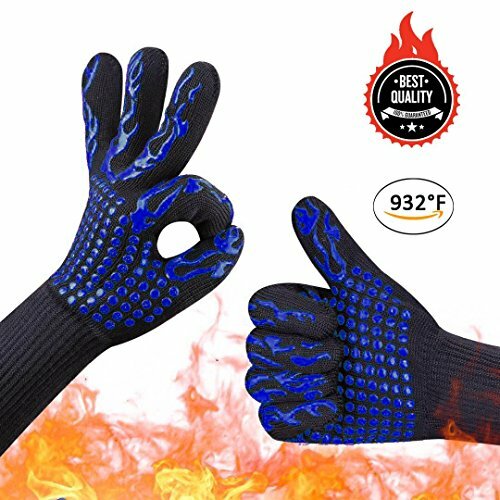 Looking through reviews on various sites, we found people stating that they were able to pick up burning logs while wearing these gloves. The cut resistance is also a big hit, making them a pair of amazing kitchen gloves. Looking at the versatility of the gloves, it is really surprising. In addition, these gloves are one size fits all, so regardless of your size, you should be able to wear them with no problems. Point blank, if you’re looking for a versatile pair of gloves that are capable of standing up against sharp objects and high temperatures, then Bluefire might just be suitable for you. The basting brush is a silicone heat resistant brush that is 8.5 inches long. It is efficient, long lasting and convenient to say the least. With the basting brush, you won’t have to worry about leaving bristled behind on your food ever again. The brush even comes with a handle that is detachable, which makes it easy to clean – since it’s friction mounted, attaching and detaching the handle isn’t going to be a problem. These shredders can be used for shredding up pulled pork and other forms of meat. This two-piece meat shredder is sharp and light in weight. It will even allow you to lift hot meat without having to worry about burning yourself. As an additional bonus, when it’s all said and done, they are dishwasher safe. When it comes to silicone gloves, we really like the fact that they are waterproof, food grade, odor proof, and stain proof. That means that if you need to pick up food without having to worry about hot juices working its way through the gloves and burning your hands, you can go ahead and do it without any problems. As an added bonus, if juices do get on the gloves, it’s not going to stick to the gloves and cause them to smell. All you have to do is rinse them off and they will be good to go. As an additional bonus, you can use them when working with frozen foods as well – that’s right, you never have to deal with the pain that is associated with frozen foods. All in all, this is a really good set. I really like how you get the shredder claws and basting brush, along with the gloves – this is definitely something you’re going to want to check out. While I recommend the Bluefire pro heat resistant gloves, this doesn’t mean there are no other options out there. That’s the good thing about being an individual, you have the freedom to choose what you like. Another option you may want to take a look at is the Awekris BBQ grilling gloves. If you’re looking for an “all in one” set, you’re going to enjoy these gloves. You can use these gloves as pot holders, oven mitts, and while grilling. Regardless of where you are, these gloves are great for handling hot items. These gloves are heat resistant up to 932 degrees Fahrenheit. The high quality, non-slip food grade silicone is responsible for this protection. For this reason, they are perfect to use while handling stuff from an instant pot, microwave, oven and yes, even the BBQ grill. With these, you could easily grab a pizza stone and dutch oven hot handles. There are a five-finger flex design and a silicone super-grip with a hook that comes in handy for hanging. It features a 5” cuff, which helps protect the wrists and forearms from high temperatures. Regardless, while out shopping for the best heat resistant BBQ gloves, you will definitely want to take a look at Awekris BBQ gloves. Another set of gloves that deserves its spot on the list of the best heat resistant BBQ gloves comes to us from Ekogrips. This particular set of gloves offers heat protection up to 425 degrees. Ekogrips are no-slip and versatile. You can use them without having to worry about juices dripping on your hands. You can reach into hot water, change a lightbulb or use them to open up a jar (now that’s called thinking outside of the box). These Ekogrips are great to have to available for use in the kitchen. They are versatile, as I previously said, so you can use them for many things you need to be done in the kitchen and around the house. Another set of gloves we recommend you checking out would be the Rapicca griller BBQ gloves. They have a 17-inch long sleeve that will come in handy for protecting your arms, along with your hands while you’re cooking. These gloves have an insulated textured palm non-slip fiver dinger design, which is something that really caught my attention. With this feature, you can easily work with meat in your bbq or smoker and make some delicious pulled pork as if you were a real pro. These gloves are comfortable, to say the least. Inside, there’s a double layer of cotton that doesn’t just make these gloves comfortable but also insulated from heat. The gloves fit loosely but will stay on your hands. 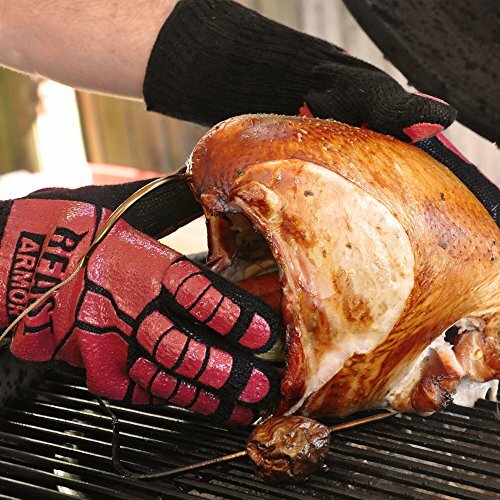 You can use these gloves for making BBQ on the grill, smokers, frying turkeys and so much more. What you have here is a pair of gloves that have been pro design to protect you while you’re working around your grill or smoker. They are made of FDA-approved neoprene rubber, so they’re fire, water, and stain resistant. To improve the grip, they have been designed with a textured palm and will do a great job even if you’re working with grease. Another good pair of gloves that deserves its spotlight on a list of the best barbeque gloves comes to us from Grill Beast. They are flame retardant and heat resistant – guaranteed to be able to withstand high temperatures of up to 662 degrees Fahrenheit. For this reason, they’re great to use while grilling, cooking, and handling hot items in your kitchen (and outside). The design makes for freedom of movement while wearing the gloves. The cuff is 4” in length, so it will help protect your lower arms from getting burnt. The outer layer of the gloves are made of Kevlar fiber, so you can rest with the satisfaction of knowing you’re using a pair of gloves that can withstand heat – they offer maximum thermal protection. The inner layer is made of a blend of cotton (55%) and polyester (45%), so they’re comfortable to wear. Both the front and the back of these gloves have a non-slip silicone coated section on them. This is a feature that I like to see on BBQ gloves because it makes it so that you have a nice grip, which is needed when you’re working with hot food. While using these gloves, you won’t have to worry about the heat sinking through to your skin. If you’re looking for a good pair of heat resistant BBQ gloves, don’t forget to take a look at this pair – I’m pretty sure you’ll like what you see. As long as you’re wearing these gloves, you will be able to pick up and carry hot items. After reading about the Steven Raichlen BBQ gloves and seeing what others have to say about them, they’re something I can’t leave off of this list of the best grilling gloves. For your next backyard BBQ, these gloves will definitely come in handy. The gloves are soft and pliable, making for an easy grasp. While the gloves are comfortable to wear, they’re also long, so they protect your wrists from getting burned. To be exact, they are 18-inches long. This makes them perfect for handling hot coals, reaching across a hot grill or while handling a chimney starter that is packed full of burning coals. These gloves are safe to use on temperatures up to 475 degrees Fahrenheit. Take note that they aren’t designed for direct contact with hot metal, so you should avoid this. Cleaning the gloves will be easy. All you have to do is wipe them down with a damp cloth when you’re done using them. All in all, this is a great pair of gloves. 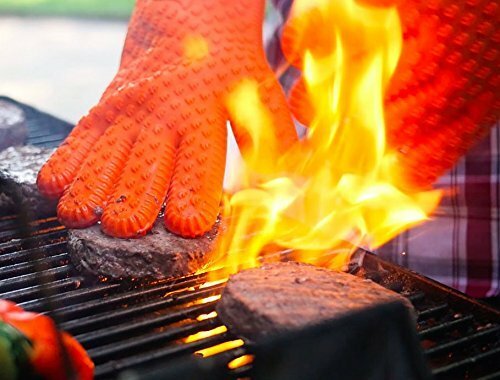 They will come in handy if you’re looking for bbq cooking gloves that offer protection while you’re grilling and working around hot food. Like most markets, the BBQ gloves market is packed full of different brands. You have brands that toss around sales pitches that will have you think their product is the best ever …until you take time to do research. Those big fancy words they use can make things even more confusing than they should be. When you’re looking for the best barbequing gloves, just make sure you have your specific needs in mind and make sure they fit your purpose. You should also pay attention to the directions and warning labels that are placed on different gloves – some are built to withstand higher temperatures than others. In the end, as long as you go with a pair of gloves from this list and you made sure they fit your purpose, you can rest with the satisfaction of knowing you have made the right choice.